After a 3-week break, we have arrived back in Craig Alaska and are prepared to continue our cruise. Today we'll motor south and east along the protected waters of Prince of Wales Island. After fishing a bit we hope to end up in Nina Cove on Long Island located along the southeast coastline of POW Island. Sunday we'll move down to Nichols Bay on the southern tip of the Island near Cape Chacon. 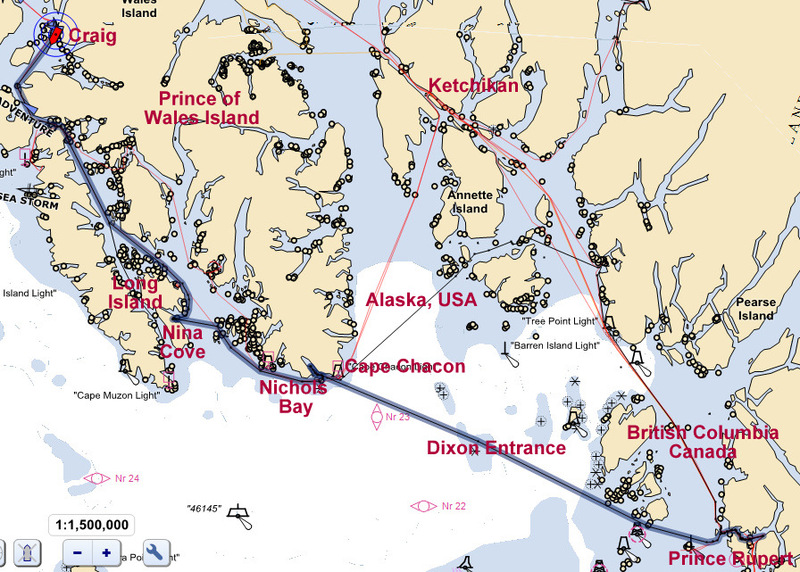 Monday looks like our best weather day for the 8-hour ocean crossing of Dixon Entrance into British Columbia. We hope to make Prince Rupert by Monday afternoon. 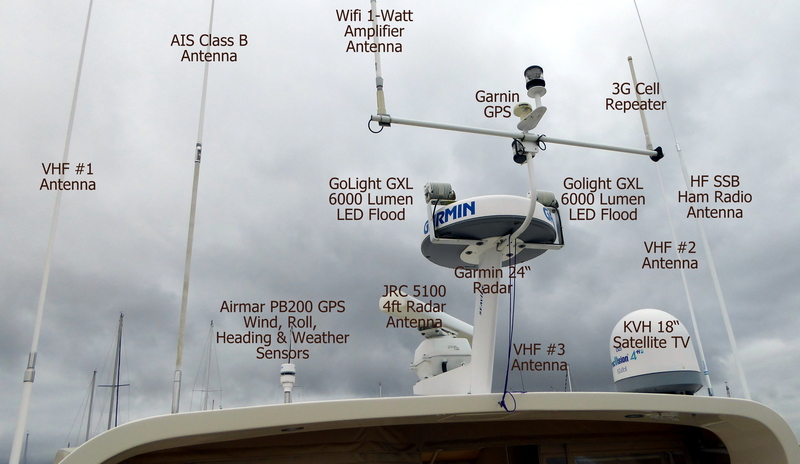 As you may know from reading this Blog, we've always encountered rough seas around Cape Chacon. Crew and Admiral Pat is not too happy about this leg. We won't be in cell or wifi range until Prince Rupert. Our Route for Saturday, Sunday and Monday if weather holds. In California we attended to Pat's mom Barbara who is recovering from a heart issue. We moved her to an assisted living facility near our home. Pat who has been assisting her mom and hasn't been aboard since May, seems a bit worried about the move, but so far so good. 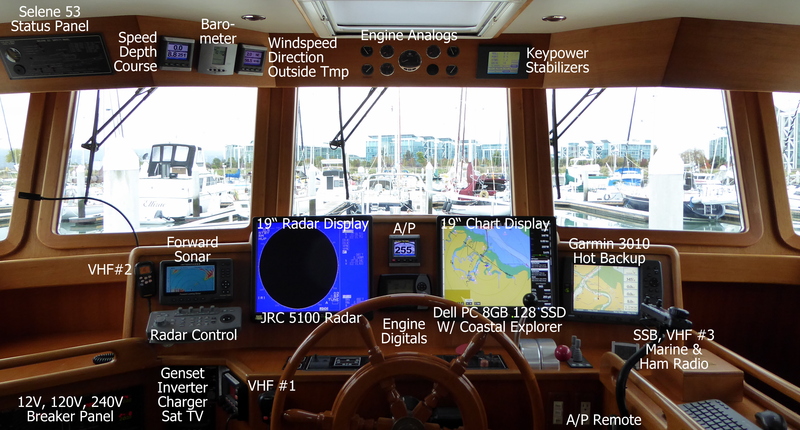 Hopefully she can now relax and enjoy cruising. Last week Alex traveled to Anacortes Washington to prepare a vacant rental property. While there he enjoyed another fabulous dining experience at Jay and Micky Field's home. Jay of Dash One Sports Fishing Charters, and Micky of Village Pizza fame, always dine heartily. Smoked salmon, smoked albacore, fresh Dungeness crab, barbecue flank steak and grilled vegetables helped extinguish our hunger. For hunger insurance, fresh berries on ice cream topped off the evening. 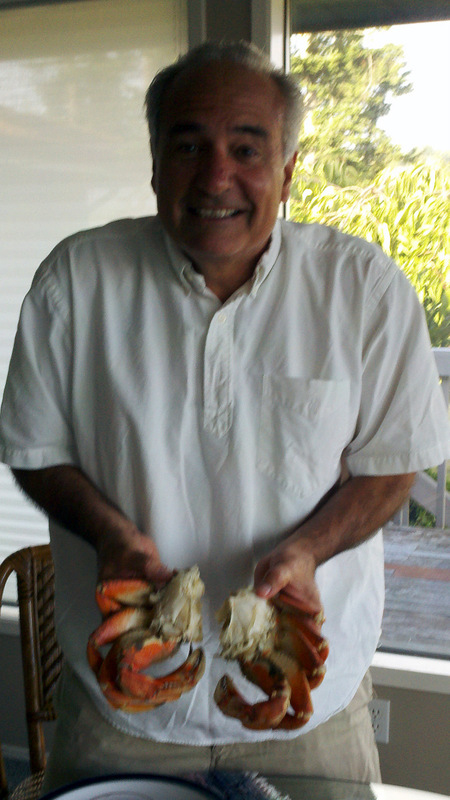 This giant was a 9-inch crab caught in a trap placed about 1/4 mile east of the Anacortes Ferry Dock. As reported in this Blog at the start of the cruise, Alex immensely enjoyed Micky's fresh key lime pie (see key lime pie). So for the past 3 months we've been searching the various grocery stores along the inside passage and Alaska for fresh key limes. We've a stack of pie crusts in the freezer waiting for fresh key limes to build a pie. It's similar to that episode in the Showtime "Dexter" series, where Dexter, a serial killer, helps a friend with terminal cancer. She wants to die, but won't until she tastes a great key lime pie. Of course Dexter assists with her suicide, but only after she finds the ultimate key lime pie. Well Micky has located a fresh key lime substitute. 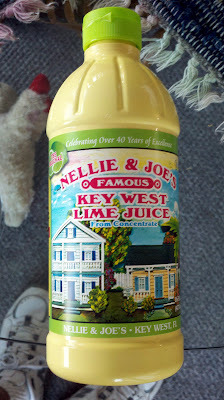 So now we're searching the stores for "Nellie & Joe's Famous Key West Lime Juice". Stay tuned. So we're off again. Hope to have something to Blog about on Monday or Tuesday.